The Musée d’Orsay has put together a sweet little exhibition focusing on a small painting by Paul Sérusier that is considered seminal for the development of 19th-century art. The story goes that in 1888, Sérusier, at the time a young artist still guided by the strictures of academic art, painted “Le Talisman” in the Bois de l’Amour near Pont-Aven after a conversation with Paul Gauguin, who offered his protégé some advice on how to paint. Compare this work with Sérusier’s naturalistic painting of a peasant couple in a dark cottage, “Interior, Pont-Aven” (displayed in the exhibition), made about the same time, and you will see just how radical “Le Talisman” was. 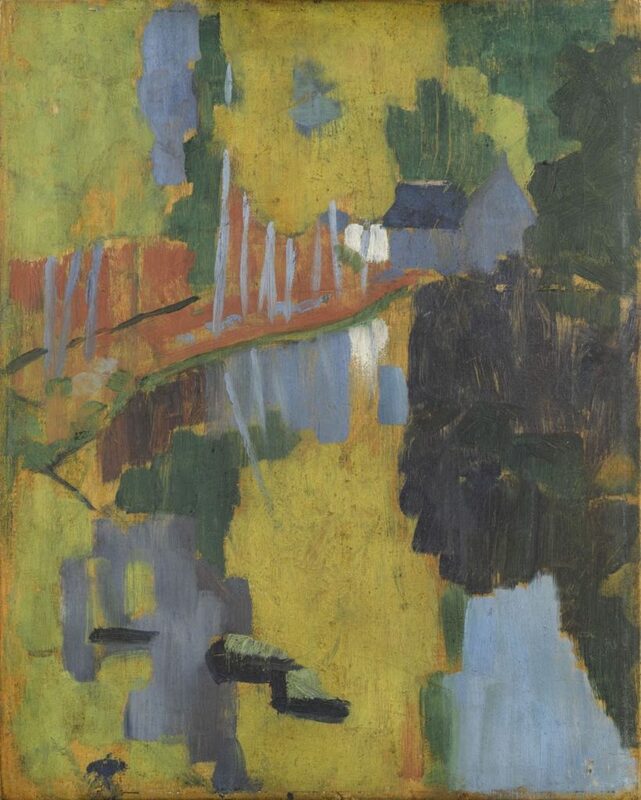 The little painting, which Sérusier gave to Maurice Denis as if it were “a relic,” according to Denis, came to be seen as a foundational work for the Nabis (Prophets), a group of young avant-garde artists looking for a new artistic direction of their own, mingling influences from Cézanne, Gauguin’s Synthetism (simplified forms, flat planes of pure colors and outlined shapes), Impressionism, Symbolism, Japanese art, spiritualism and the English Arts and Crafts movement. The exhibition presents some 60 works by Gauguin and his fellow Synthetist Émile Bernard, and by Nabi artists. 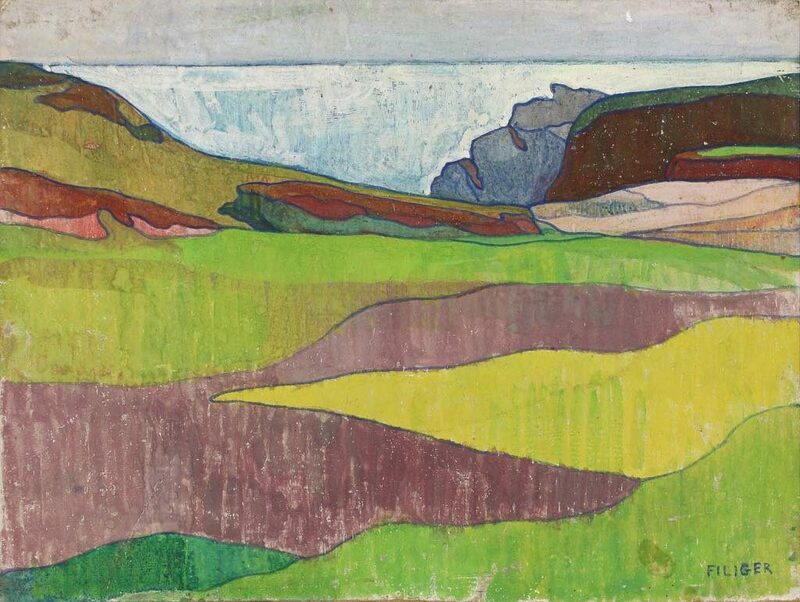 In addition to Sérusier, the group attracted big names like Pierre Bonnard, Édouard Vuillard and Denis, but the show also includes a number of interesting works by lesser-known artists like Georges Lacombe, Ker-Xavier Roussel, Mogens Ballin, Jan Verkade, Paul-Élie Ranson and Charles Filiger. The last-named, a talented acolyte of Gauguin who fell victim to alcohol and came to a sad end, is represented by only one work, the colorful landscape “Paysage Rocheux” (c. 1891). 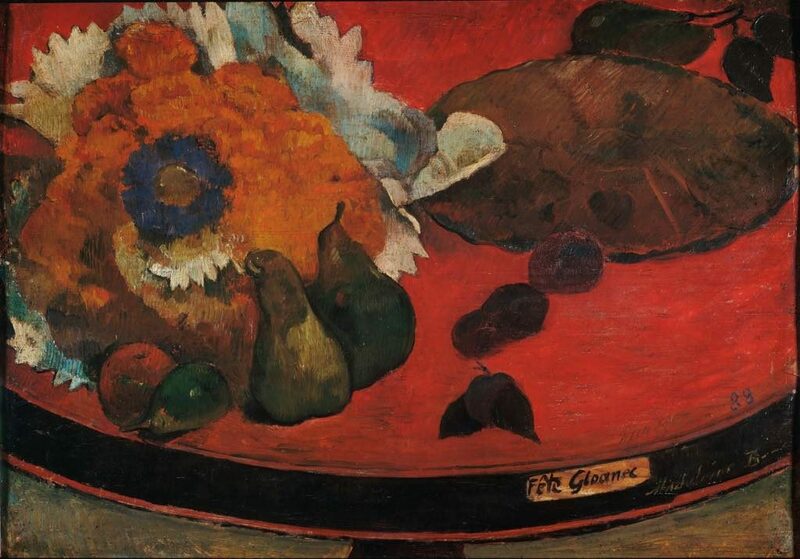 One of the more striking works on show is a bold still life by Gauguin, “Fête Gloanec” (1888). The objects, placed on a blazing-red table, are seen from on high and have no symbolic meanings as in Old Master still lifes. 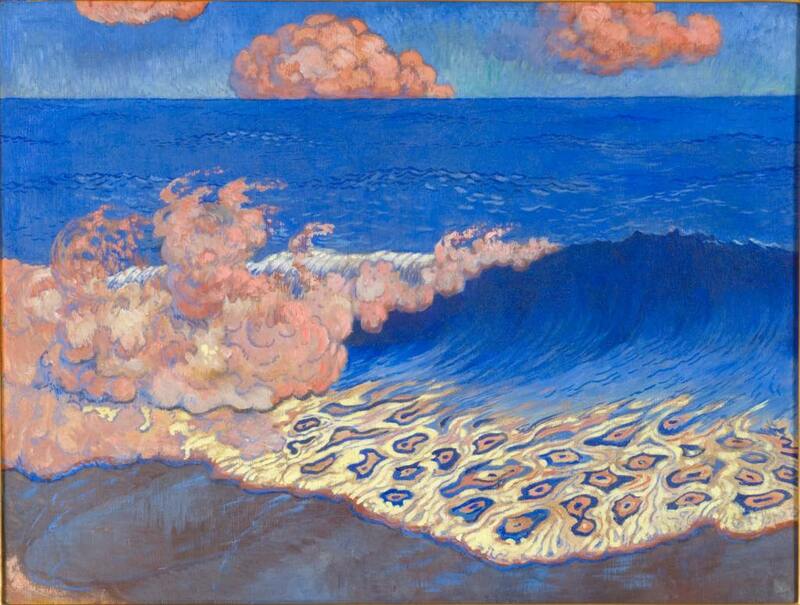 Another work that stands out among the paintings of spindly trees favored by Denis and other Nabis is “Marine Bleu, Effets de Vagues” (c. 1893), by Lacombe (pictured at the top of this page), with its intense blues and pinks and the peacock-feather pattern of the breaking waves on the sand. When you finish looking at this small exhibition, make sure you linger in the surrounding rooms, which contain many more treasures by Nabi artists, including Vuillard, Bonnard and, most interestingly, Félix Vallotton. Wish I could see this exhibition. I never heard of most of these Nabis, although I do recall hearing of this group. Those peacock feathers! Thanks…. Such an informative article on a painter I’d not encountered. Many thanks for it. Wish I were in Paris to see the exhibition.